Duluth City Hall is located at 411 West First Street, Duluth, MN 55802; phone: 218-730-5370. 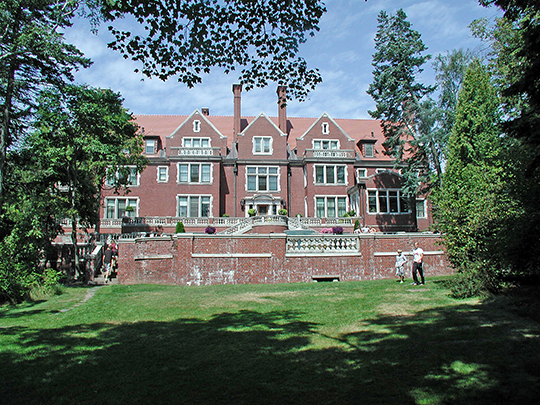 Photo: Glensheen (Chester and Clara Congdon Estate), ca. 1909, 3300 London Road, Duluth, MN. Jacobean Revival mansion designed by Clarence H. Johnston, Senior for Chester Adgate Congdon. Now a house museum operated by the University of Minnesota Duluth. Listed on the National Register of Historic Places in 1991. Photographed by User:Derek Heidelberg (own work), 2006, [cc0-by-1.0 (creativecommons.org/publicdomain/zero/1.0/deed.en], via Wikimedia Commons, accessed March, 2014. In the late 1860s Duluth attracted wealthy settlers from the eastern United States who had come west to speculate in land development. Nearly one-half (47.2 percent) of the American-born population came from New England and the eastern seaboard states north of Virginia, while the rest hailed primarily from Michigan, Wisconsin, Ohio, and Illinois. By 1870, the population of the recently chartered city totaled 3,131, of whom nearly sixty percent were foreign-born. Due to the important role the Philadelphia-based Jay Cooke and the Enoch W. Clark and Company had in financing the construction of the Lake Superior and Mississippi Railroad from St. Paul to Duluth, and because of the large number of professionals and businessmen from Philadelphia, Duluth was known as "Philadelphia's western suburb," and "a colony of Philadelphia" in the press. These early residents contributed intelligent leadership, investment capital, and vision to the nascent city, building a strong foundation for its future growth. Industrial and commercial zones began to take shape in Duluth during this time, their locations largely influenced by the need for access to the lake. Though frozen for several months of the year, Lake Superior was destined to become Duluth's primary lifeline to markets, goods, and products during its early development. The city's commercial district rose along Superior and Michigan streets near the lakefront, providing goods and services to shipping crews, new arrivals, and local residents. Duluth's commercial district was established downtown near the waterfront in the early 1870s, after the Lake Superior and Mississippi Railroad (reorganized as the St. Paul and Duluth Railroad in 1877 and absorbed into the Northern Pacific system at the turn of the century) reached Duluth in 1870. One pioneer Duluthian who arrived just before the railroad in 1869 described the nascent town: "The haphazard, scraggly and repellant settlement of that time, a mixed combination of Indian trading post, seaport, railroad construction camp and gambling resort, altogether wild, rough, uncouth and frontier-like, bore not the remotest semblance, physically or otherwise, to the city it now is." Despite such an inauspicious portrayal, Duluth's location at the western end of Lake Superior and its proximity to three key natural resources — lumber, wheat, and iron ore — helped establish the city as one of the nation's major timber processing centers from the 1880s to the 1920s, and as a significant grain and ore shipping port from the 1880s and 1890s into the early twentieth century. By that time, Duluth was well known as northern Minnesota's economic, social, political, and cultural hub. The booming town's prosperity was reflected in the bustling commercial district on Superior Street, 1st Street, Michigan Street, and the avenues bisecting these streets. Michael Koop and Chris Morris, Minnesota State Historic Preservation Office and National Trust for Historic Preservation, Duluth Commercial Historic District, St. Louis County, MN, nomination document, 2006, National Park Service, National Register of Historic Places, Washington, D.C.